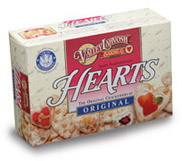 ** Heart Shaped Crackers: I found these crackers at our local grocery store, but you can also order them online via amazon or directly from the Valley Lahvosh company. If you cannot find these crackers I also saw several recipes for heart shaped crackers online. ** Strawberries Cut into heart shapes (you just cut them in half and then kind of V cut the stem out)..
1. 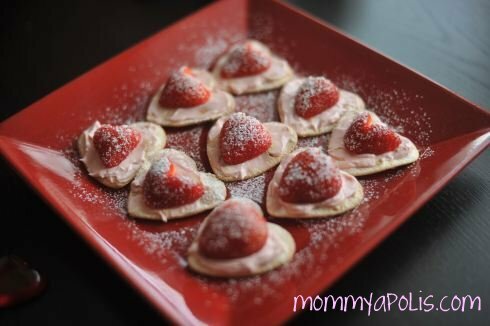 Spread the cream cheese on the crackers and top with half of the strawberry that is cut into the heart shape. Sprinkle the crackers with powdered sugar.